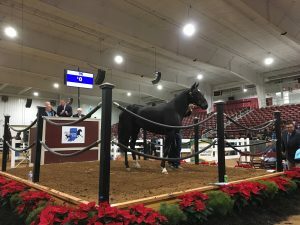 A large crowd was on hand for the second annual Midwest Mixed Sale at the Michiana Event Center Friday, Nov. 23, 2018. A total of 147 entries were included in the lineup that ranged from weanlings to brood mares to racehorses. The sale topper was Hip No. 113 Southwind Thundra, a two-year-old filly by Bettor’s Delight and a sister to two with earnings in excess of $1 million, including Southwind Tempo. The filly brought $77,000 in the ring and was purchased by Merlie Schwartz of Peru, Ind. Another filly that grabbed a lot of attention was the three-year-old trotter Red Rose Swan, consigned by LeWayne Miller Racing of Anderson, Ind. The Swan for All sophomore, who has a mark of 1:55.3, brought a price of $70,000. Marlin Eash of Shipshewana, Ind. was the buyer. 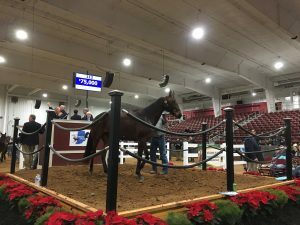 The Midwest Mixed Sale was a precursor to the second annual Michiana Classic Yearling Sale, which is slated at the facility Saturday, Nov. 24. A total of 224 yearlings are cataloged with the sale getting underway at 9:30 a.m.